The term ‘the Asian century’ was coined in the mid-1980s, to describe the seemingly-inexorable rise of Asia to a position of global dominance over the course of the 21st century. With China alone accounting for over one billion people—a massive share of the global market—it’s no surprise that Asia is already a formidable industrial power, and the tech hubs that have sprung up in Japan, Hong Kong, and mainland China only serve to reinforce this impression of the region as a powerhouse of global progress. In this shifting global business landscape, the challenge for young professionals is how to hit the ground running. According to Shige Makino, co-director of the brand-new MSc in Management (MiM) program at the Chinese University of Hong Kong (CUHK) Business School, technology is fundamentally changing how we do business—and students need to be prepared. “Business transformation will make a tremendous impact on the job market in the future, because we have been living in a so-called ‘hardware economy.’ Now, we are facing a more software-centric economy—and these two types of economy are quite different,” he says. In a hardware-centric economy, Shige explains, there is an emphasis on teamwork: employees work together, building a communal knowledge and skill-base that then becomes an organizational strength, and the company’s competitive advantage. In a software-centric economy, on the other hand, there is no requirement for every member of the team to have the same level of skill. It only takes one genius software engineer to write an innovative program and with it, to rewrite the whole system. “In a hardware-centric economy, the leader’s main role is to manage the team effectively, but in a software-centric economy, a manager’s role is to identify and give opportunity to specialists,” Shige says. Lasting for one year, the course verses students in all the traditional aspects of management education, while also offering a series of electives that promise to introduce them to the cutting-edge business issues of the day. One of these courses is in business model innovation, exploring the effects of the leadership shifts that Shige mentions. Others include electives on data analytics and topics such as fintech—one of the most impactful areas of technological change today, as systems like blockchain hold the potential to decentralize banking across the world. These courses do not aim to turn students into the specialists or genius code-writers that will be essential to business teams as time goes on: rather, it equips them with the skills to identify those people and manage their skillsets to get the best outcome for the business. “It’s important to [note] that the intention of the MSc in Management program in the courses [like those on] fintech and the digital economy is that students will have enough background knowledge to be able to make the connection with business,” says John Lai, Shige’s co-director for the MiM course. Hong Kong is certainly fertile ground for such an education. 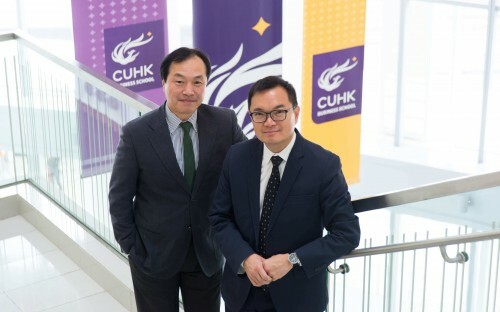 And CUHK Business School is situated close to the Hong Kong science park, giving it close proximity to the startup center of the city. Plus, only 25 minutes away by train lies the tech hub of Shenzhen, the heart of tech innovation in Southern China. For Shige and John, one of the key elements of the course is the exposure that students get to experts working in the fields they’re interested in. The program is practice-oriented, balancing in-class experiences with learning sessions that take place outside the classroom. This can mean anything from the series of entrepreneurship-focused talks in which young startup leaders return to the school to share the elements of success with the students, to the two-week capstone course at the end of the program, in which all MiM students spend two weeks acting as consultants for businesses in emerging economies. For Shige and John, the key is in opening students’ eyes to the many opportunities that are available to them, as long as they know where to look.